The historic Chandos Lawn Tennis Club celebrated its topping out this week, marking a milestone in the construction of the Club’s new home which adjoins the local Conservation Area in Barnet. The project maximises usage of the site, featuring four indoor and four outdoor LTA Recreational Standard tennis courts together with a junior court and a clubhouse offering a lounge, offices and changing rooms. 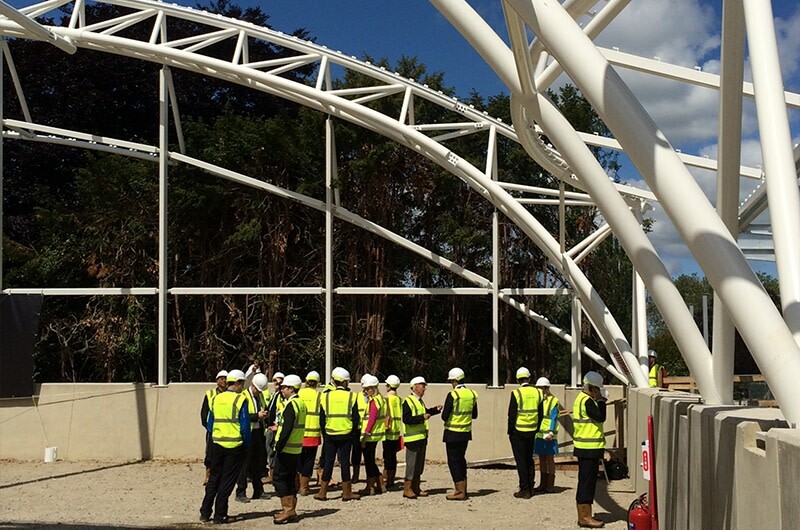 The covered courts are sunk into the ground to account for a level change and to minimise their perceived massing from the surrounding area; they will be covered with a series of elegant steel trussed arches supporting a tensile fabric roof. The clubhouse will feature full-height glazing to allow views towards the courts and will be capped with a green roof with solar thermal and PV panels to reduce its environmental impact. The existing listed railing along East End Road will be retained and refurbished and new landscaping will be planted throughout the site. The BREEAM Very Good project is expected to be completed in November 2015.